This information is meant to help develop independent reading skills. You are your child’s best source for help. Model what you do when you read and then discuss it with your child. Show them reading is important to you. Although some of these may be more advanced, many of them can still be demonstrated and modified for younger children. “Fix-it” strategies can help all age levels. Practice these skills one at a time so that your child does not become overwhelmed. READ! READ! READ! Read to your children often. Read different genres and from different sources. Show them the importance of being literate. The text and your life. The text and what you already know. The text and another text. Skilled readers understand that using information they already know can help them understand what they are reading. Practice making connections with your child and explain how this helps them with their reading. Making predictions about what is happening in a story can help the reader stay on track because it causes the reader to revisit ideas within the story. Predictions can help readers stay involved with what they are reading. While this one may seem rather obvious, you’d be surprised at how often students do not practice it! Stopping and thinking allows readers to question, visualize, synthesize information, determine importance, and allows for connection to what is already known in the readers mind. Taking the time to find out the who, what, where, when, why, and how in a story can assist in clarifying questions a reader may have about what is going on. Students need to know that asking questions is alright and that fluent readers ask questions throughout their reading. Writing down what they think about allows the reader to clarify their thinking. Have your child draw a picture of what they have read. Have an older child write a letter explaining a story. Any writing activity is an opportunity to reflect, clarify, and further understand what has been read. Skilled readers create a picture in their mind as they are reading, almost as though there is a movie playing in their head. 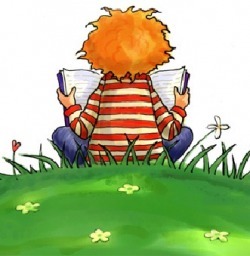 Help your child create an image by talking about the pictures you create as you’re reading. Associating what they read with the images they have helps improve comprehension. Authors use key words, bold print, italics, capitalization, and punctuation to convey their intent. Understanding how these conventions are used can then enhance understanding the text itself. Taking the time to review these concepts with your child can help with comprehension. Retelling a story can help a reader reflect on what they have just read. Have your child retell stories to you and make sure to ask questions while your child reads. This refreshes memory and prepares for further reading. Readers who do not practice recalling text will attempt to do so while they read new material and as a result do not pay attention to the new material they are reading. When meaning breaks down while reading, let your child know that rereading is sometimes a necessary step in achieving comprehension. Let them know it is okay to go back and reread-proficient readers dot his all the time! Let them know that they do not necessarily have to read the entire text, but that referring back to a sentence or even just a word. Rereading does not mean rereading everything. Reading well does not necessarily mean reading fast. Skilled readers adjust their rate of reading to meet the demands of the task. They know when they need to slow down in order to understand something. Reluctant readers may often think that skilled readers always read fast. Show your child the times when you need to slow down in order to understand something, and help them recognize when they need to.